My sister graduated from college last weekend, and while I’m more proud of her than I can say, it did require an eight hour drive from my parents’ house in Maine all the way to Ithaca, New York. Faced with the thought of a long, boring road trip, we decided to head down early to do a little birding as we drove. 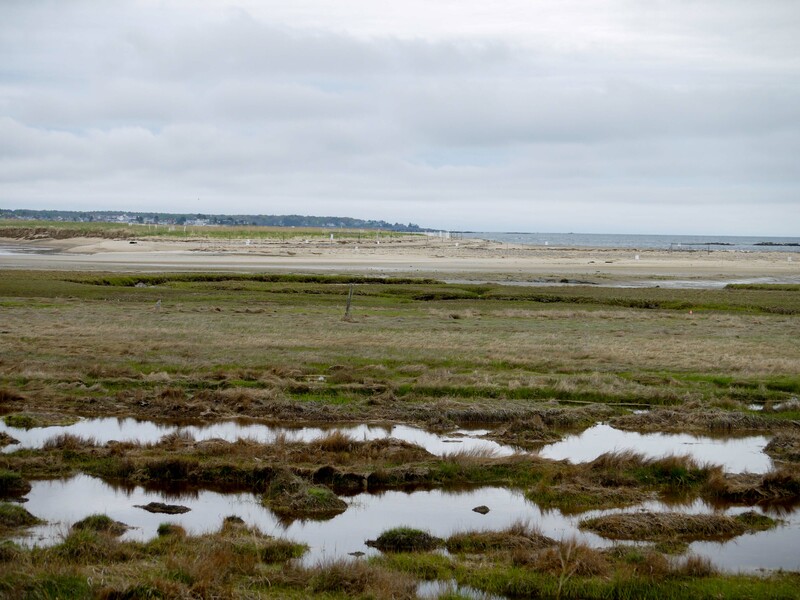 The Wells Estuarine Research Reserve was right on the way. The reserve is one of those unique mixes of ecology and history. 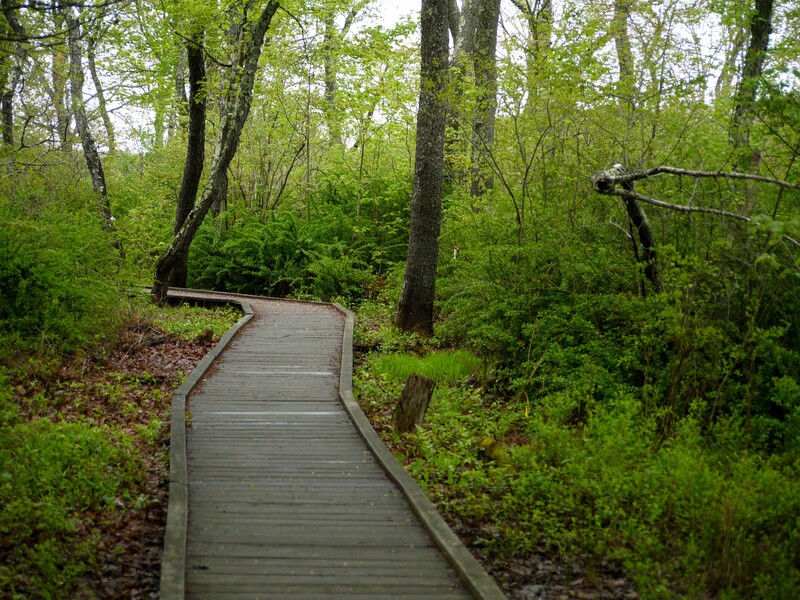 Full of different habitats, we hoped to see forest, marsh, and field species all in the space of an hour. 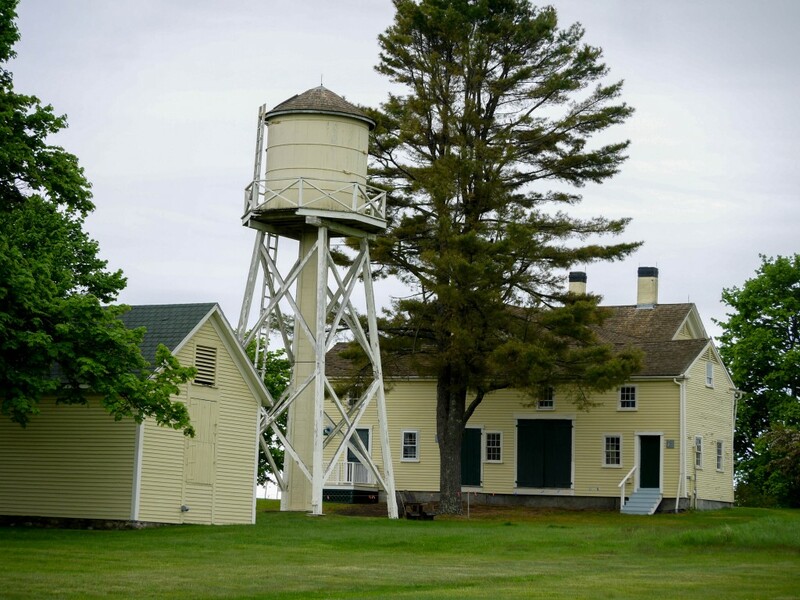 The buildings that were once part of Laudholm Farm are at the head of the trails, painted a pale yellow and now the center for the different programs, research, and educational activities the reserve is known for. The site has been farmed since the 17th century, gaining its name in 1908 when brothers Robert and Charles began livestock management. While the buildings themselves were in pristine condition, I was more interested in what wildlife called the reserve their home, and we headed off down a trail. The first path we chose ran through a field with green grass on one side and golden stems on the other, partly obscured by a damp fog that swirled just out of reach. Fifty yards ahead of us a black bird rose in flight. Too small for a crow, too stocky for a grackle, I realized almost too late that it was a Bobolink – a life bird for me! Luckily I snapped one mediocre photo before it disappeared into the vegetation, confirming my mother’s initial suspicion. 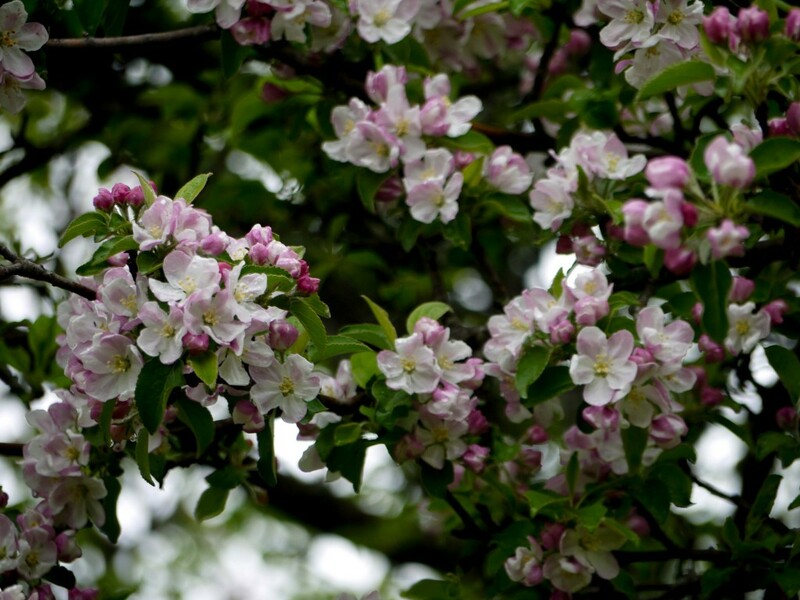 From there the path descended into short trees, pink and white apple blossoms periodically perfuming the air. Birds were plentiful as well. 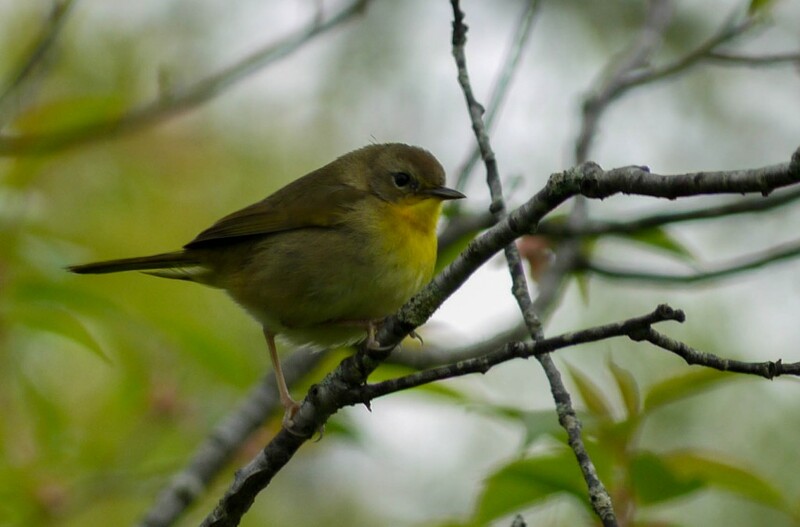 Eastern Towhees sang “Drink your tea-ea-ea-ea” from the tops of trees, and Common Yellowthroats – one of my favorite warblers – sang and chased each other amidst the bushes and brush. By waiting and attempting to mimic them, we coaxed a male and a female into plain sight. 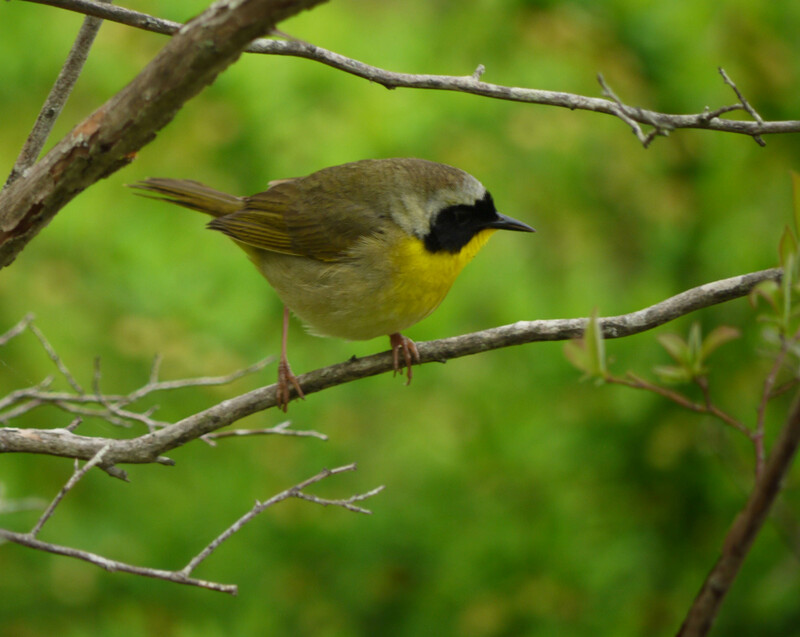 The male sported the signature black face mask that made yellowthroat identification easy, while the female was olive brown except for a dash of color right at her throat and chest. Throughout the rest of the walk we couldn’t go twenty feet without hearing or spotting another Common Yellowthroat pair. Though they were everywhere that morning, I didn’t mind – they look like pure drops of sunshine as they flit around the shady woods. As we approached the marsh and the ocean, the trees increased in size and breadth. Red maples dominated a damp bottomland forest, with ferns and skunk cabbage covering the forest floor. 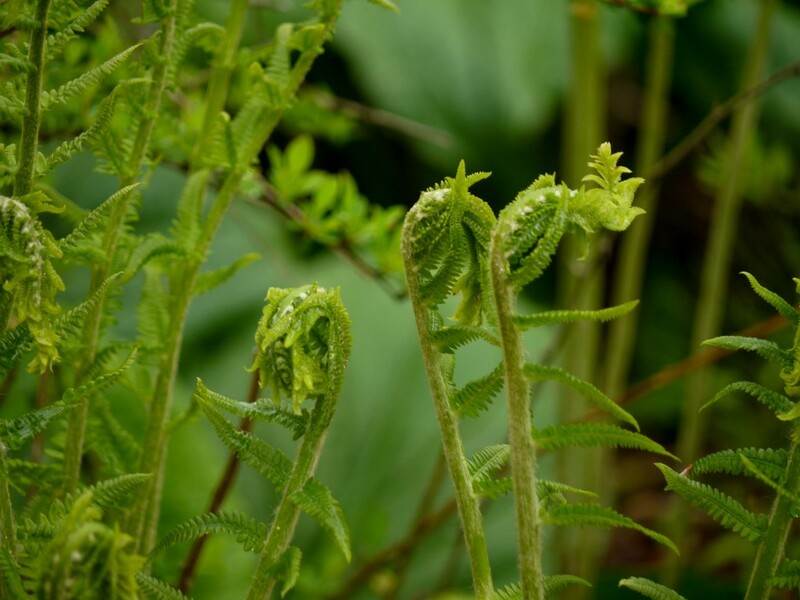 It was May, but because of spring’s late arrival the ferns were still curled, waiting to unfurl but not quite there yet. Ferns are beautiful in their green glory, but there’s something whimsical about their coiled stems just before they leaf out. Finally we reached the marsh overlook, with a view of undisturbed beaches and the ocean beyond. Though we had barely walked a mile, our consistent stopping to photograph birds or plants had drastically slowed our progress and already we had spent an hour in the reserve. We saw little sign of bird life, but we could hear the gulls and the terns farther along the beach, and these spots are prime nesting habitat for terns and shorebirds. It had been foggy most of the morning and throughout our walk, but now the sun was shining and warming my face and bare arms. The thought of returning to the car was unpleasant, but eventually it was time to go on. The Wells reserve is over 2000 acres, and we only saw a fraction of it. At the end of my blog posts I almost always tell myself I will return to take a better, more thorough look around the natural places I visit. I want to revisit every single one, and the reserve is definitely on the top of my ever growing list! very nice pictures, beautiful country photos as well.